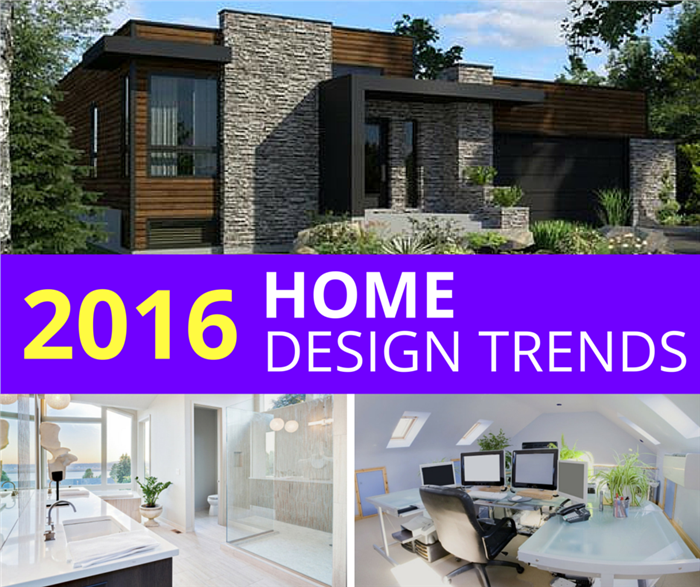 With 2016 quickly approaching, it’s time to think about new home design trends for the New Year. In 2015, we started to see both growing families and younger, often first-time, home buyers enter the market. This trend is expected to accelerate in 2016 – and house designers will be ready! Here’s what to expect in the 2016 home. 1. Smartphones Make Smart Homes an Affordable Reality. Who doesn’t have a smartphone these days? Consumers are turning to easy-to-use apps on their smartphones to manage network-enabled lights, thermostats, smoke and carbon monoxide detectors, and even video surveillance. Think Google’s Nest, iPhone and Android technology, and the “Internet of Things.” These apps make daily chores less time-consuming while also helping homeowners to “go green” by reducing energy consumption. You need a good Wi-Fi signal for these kinds of applications, so builders are prewiring house plans with co-axial and fiber-optic cables terminating in strategic spots to ensure that Wi-Fi routers can cover every corner of the house. Another tech trend: Smart televisions enable continuous viewing from every room in the home, topped off by integrated security and audio-visual sound systems that are tied to the Internet for the ultimate in entertainment. 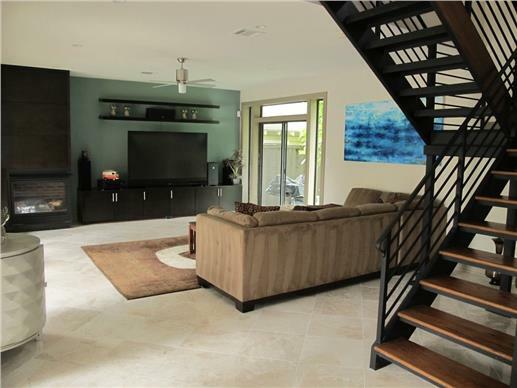 A modern two-story, four-bedroom home can be wired for security and audio-visual systems through a huge television screen and media center in the living room (Plan#116-1081). 2. Come and Get It! White-on-White Double-Island Kitchens. 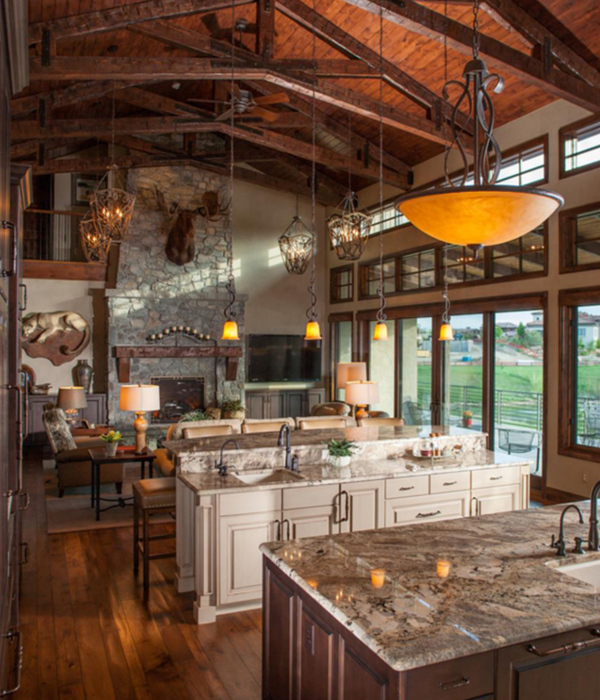 Open floor plan living, in which the kitchen, dining, and living (or great room) areas of the home flow into one another freely without walls or barriers, has resulted in generally larger kitchen spaces. Designers are responding with back-to-back or side-by-side kitchen islands, one for preparing and cooking food, the other for serving, dining, and socializing. 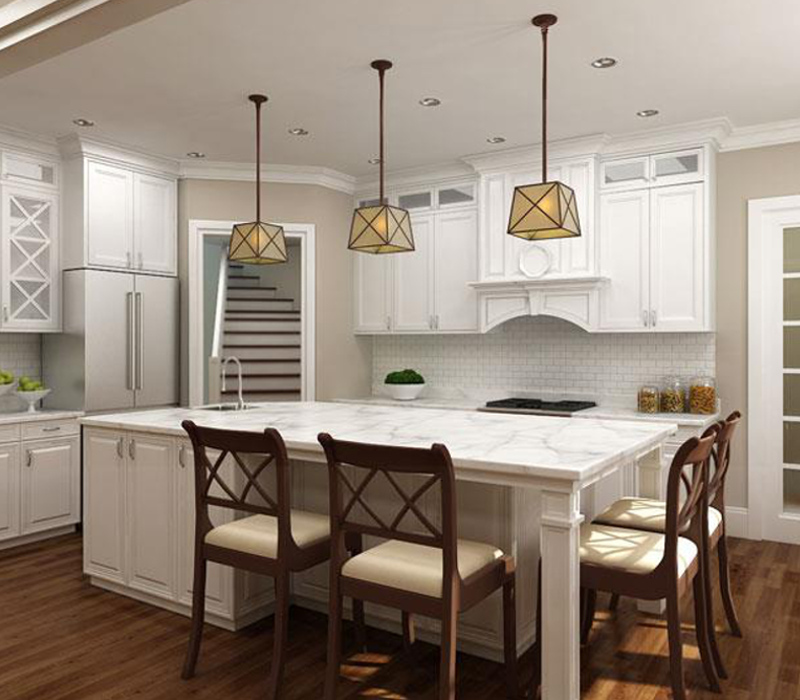 Another trend in kitchens is taking neutral design to extremes in white-on-white decor. Clean, sleek, and very modern. A thoroughly modern and gorgeous kitchen will inspire even the most amateur of cooks to spend time in it. Left: This open floor plan home (Plan #161-1053) with vaulted ceilings is perfect for a kitchen with large double islands. Right: The yellow hanging lamps, dark hard wood floors and chair backs provide a wonderful contrast to the otherwise all-white color scheme (Plan #106-1286) . Open-plan living certainly has its advantages: the family can enjoy each other’s company whether cooking, enjoying a snack at the eating bar or dining table, or relaxing on the sofa: everyone is in sight of each other. But everyone needs some alone time, too, so house designers are incorporating spaces into their floor plans, such as reading nooks or game rooms, designed to encourage relaxation or recreation in smaller groups. You will also find “secret rooms,” with hidden entrances – say, for the kids, where they can play and enjoy their toys without disturbing the rest of the family. 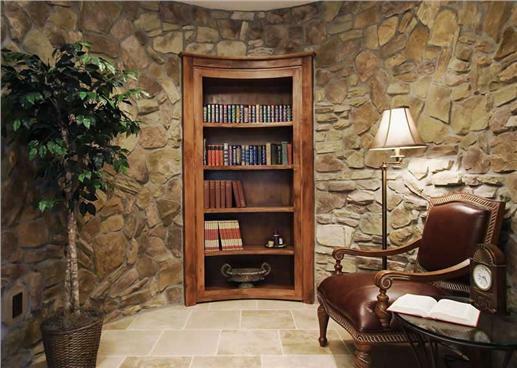 Here’s a perfect place to spend some “alone” time away from the family: a beautifully furnished private study of a two-story Tuscan style home (Plan #101-1353). Open-plan living strikes again . . . designers are starting to do away with grand, formal entrances to homes that are separate from the rest of the living area. 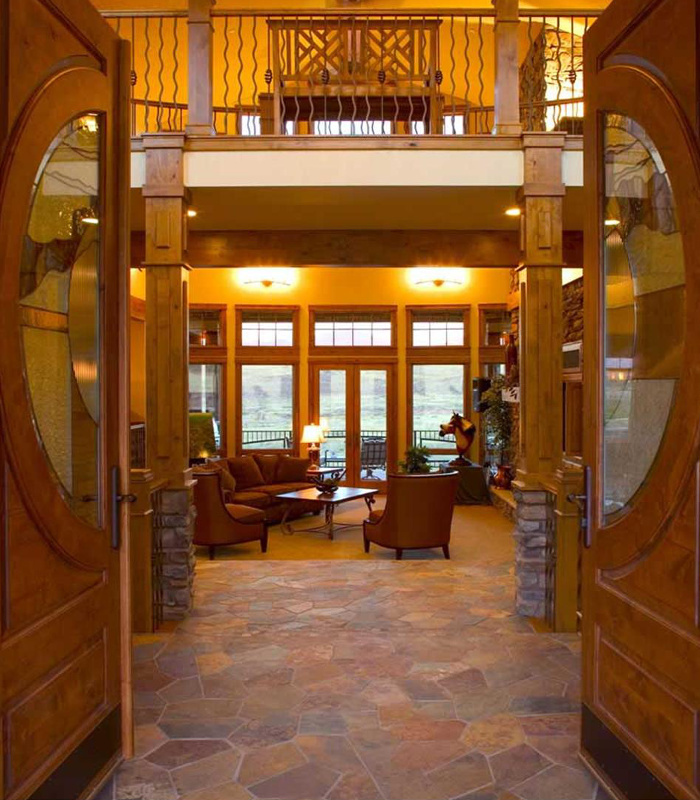 Instead, they use oversize doors with sidelights or double doors to make a statement, but the doors open directly into the open living area of the home to immediately welcome guests. Open the double doors of this elegant two-story Craftsman style home, and you’re inside the well-designed living room with a view of (and easy access to) the outdoor deck (Plan #161-1017). 5. 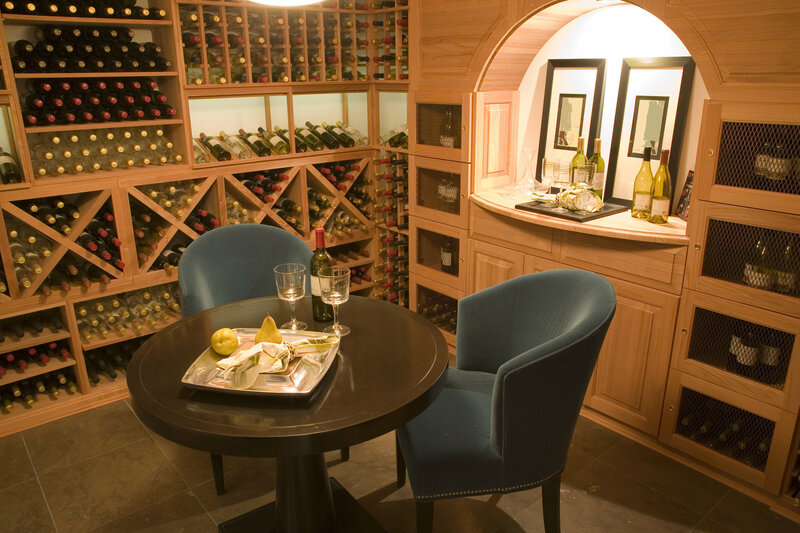 Wine Rooms and Bars. Wine is more popular than ever as a staple in social circles, and combined with the popularity of retro entertainment like Mad Men and actors enjoying wine on popular TV shows from Scandal to The Good Wife, designers have been inspired. Wine centers – even rooms – are sprouting up in home designs, and even bars, complete with sophisticated cocktails, are making a comeback. Relax after a long week with some friends? 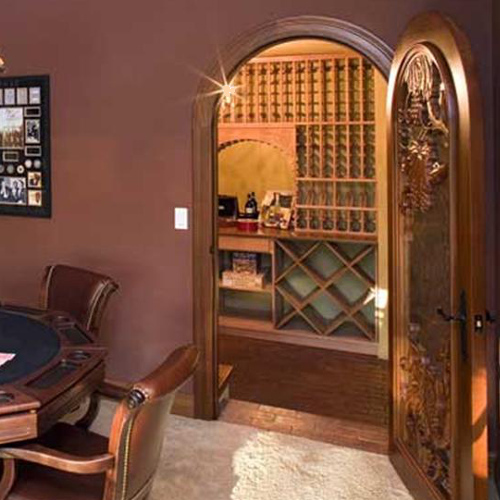 This wine cellar of a one-story country home with European touches is very accessible to the game room (Plan #165-1077). 6. The Ultimate in Luxury: His and Her Bathrooms. 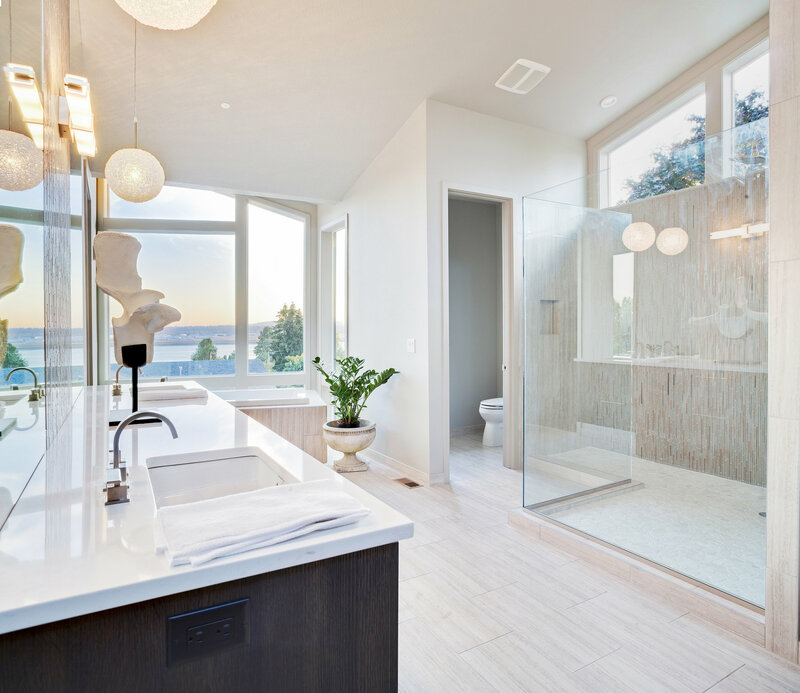 There has been no let-up among designers in direction of creating a sumptuous spa-like environment in the bathroom, especially the master bath. This trend has been popular for years. Now it is going a step further. It seems we are no longer satisfied with double vanities in a large, luxurious bathroom: now each of us needs his or her own bathroom. While that may seem extreme, often there is a compromise: a master bath with a single water closet (compartmented toilet) and single shower (with double – or more – showerheads) but two separate (and separated) vanity areas with sinks so partners don’t intrude on each other’s “getting-ready” space! Left: This modern master bath has a private water closet (toilet), a walk-in shower larger than most closets, and spectacular views. Homeowners nationwide in drought affected regions of the Western United States are being asked to cut their water consumption and “drought shaming” is now mainstream. For those building in one of the nation’s regions affected by water shortages or simply environmental concerns over wasting water, homeowners now require environmentally friendly water reuse for the home, and drought landscaping with native, or indigenous, plants, to cut outdoor water usage. 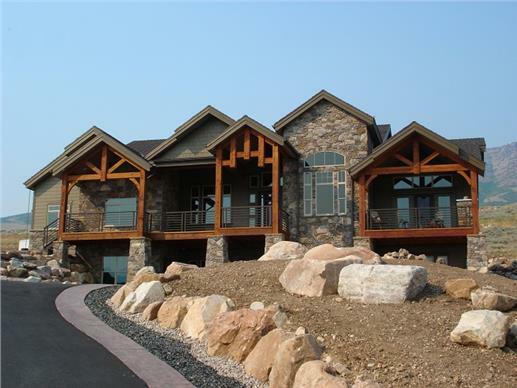 Left: This Mountain West home gets creative with its front yard, which has different colors and styles of gravel, rock, and brick along the driveway, and handsome facade, which features native stone (Plan #135-1087). Right: The courtyard of this two-story Mediterranean style home features shrubs and trees that are common to warm climate areas (Plan #107-1207). In other areas of the country, non-native plants like bamboo or kudzu become invasive and cause a lot of problems. In some cases, landowners may be fined by local authorities for using invasive plants. Not only does landscaping with native plants solve these issues, it often requires far less maintenance – ideal for homeowners who would spend their time and money on other pursuits. 8. 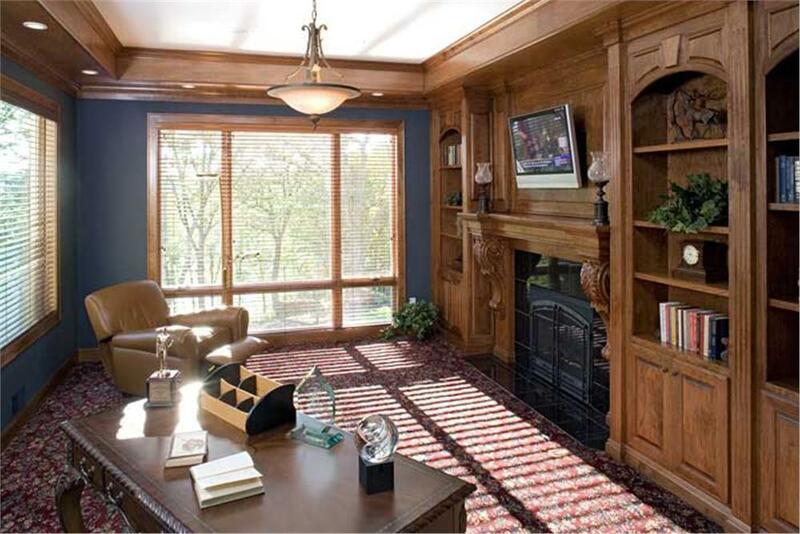 More Than a Luxury: Home Offices. Advances in communication and information technologies have enabled a more mobile workforce – reflected in the growing number of Americans working from home, which has grown 1.5 times faster over the past decade according to the Census Bureau. 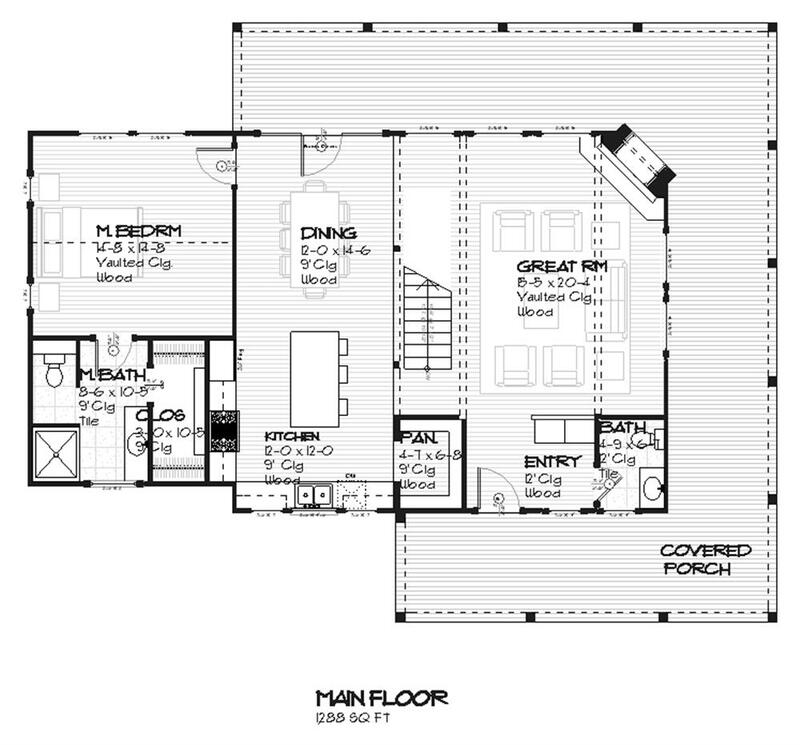 House plans reflect work spaces, offices, and multiple work stations as opposed to guest bedrooms or hobby/game rooms. 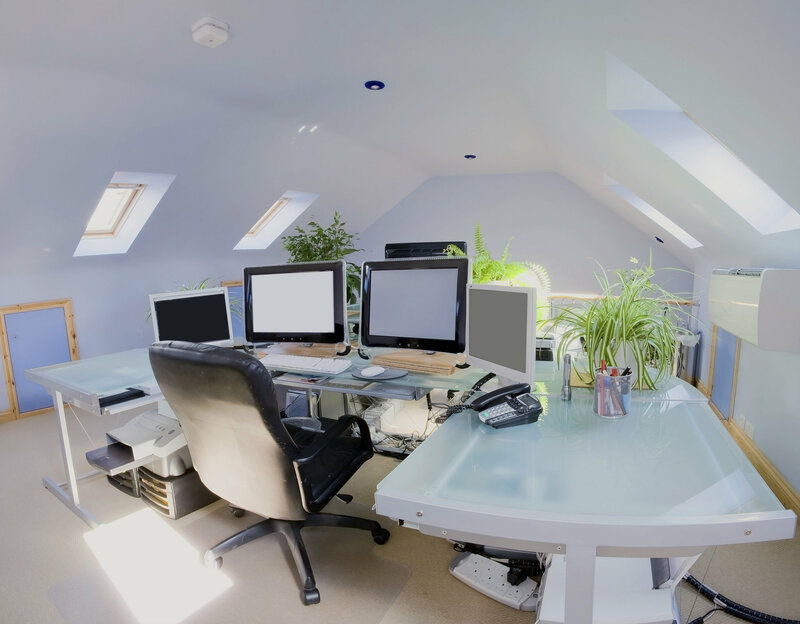 Upticks in flexible working hours, telecommuters, and self-employment mean the home office is a necessity more than a luxury. Left: Everything you want in an office can be found in this well-appointed room – a window with a view of the outdoor landscape along with peace and quiet in the privacy of your home (Plan #165-1077). 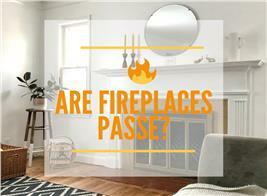 Right: For someone who spends plenty of time on a computer, this conversion of a bonus room might be a better design. Livability research from The American Pet Products Association (APPA) reveals that the profile of pet ownership is shifting towards younger, millennial owners who enjoy pampering and spending more for their animal friends than prior generations. 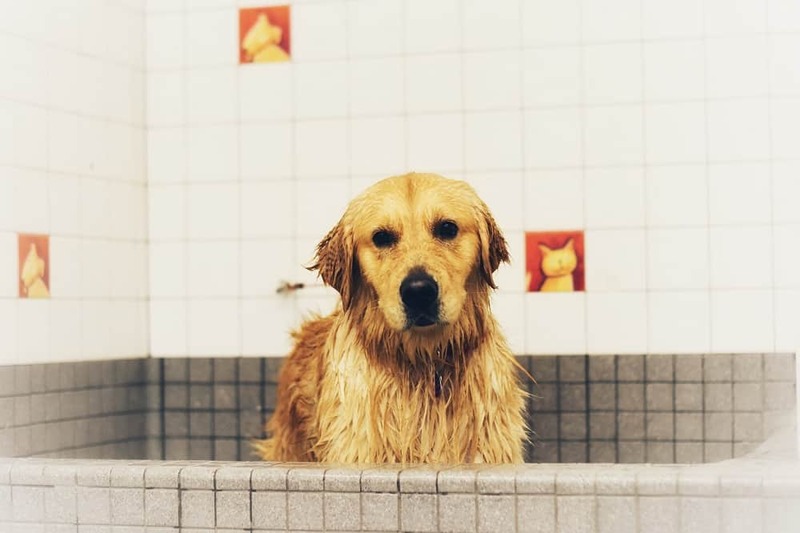 Pet owners who are building new homes will seek everything from outdoor drinking fountains and play areas with pet hammocks to indoor feeding and grooming parlors with canine showers. Above: A mud room is a perfect spot for these showers. You can rearrange furniture in this large mud room to accommodate a shower for your pet (Plan #163-1047). 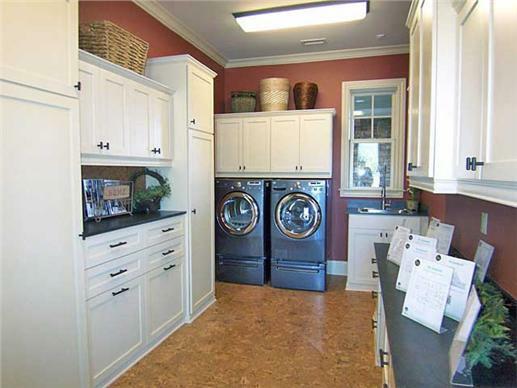 Pet showers and re-designed laundry rooms for pet needs are part of the design trends you can expect in the 2016 home. 10. Connecting with Nature: Indoor/Outdoor Living. Perhaps linked to the desire for open-floor-plan living, designers are providing spaces that blur the line between indoors and outdoors. Think living areas with expanses of glass that open onto patios or decks, which become extended living areas. Sliding glass doors with three panes, which open twice as wide as conventional sliding doors, create a more-open space and, with highly insulated glass panels, make the indoor space more comfortable in colder weather. 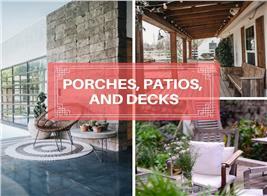 Outdoor kitchens, outdoor “living rooms” with indoor/outdoor comfortable furniture, and outdoor fireplaces or firepits all play into designing living spaces that connect with nature. Outdoor living is now part of living in warmer climates. This modern Florida-style house plan offers well-defined use of open space. The kitchen provides a panoramic view to nature and has access to a pass-through to the pool deck and summer kitchen with stone fireplace. 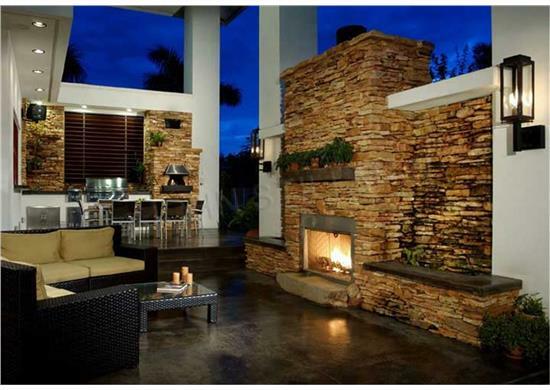 A unique outdoor BBQ area features a pizza oven that is flanked by spectacular cascading waterfalls (Plan #107-1015). As we move into 2016, families looking to build a new house have so much to choose from as they search for the perfect home plan, and designers are responding by offering designs that suit their lifestyles. 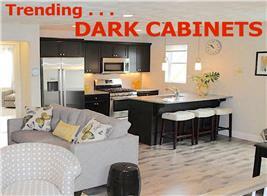 Footnotes: The lead image in this article is a one-story, two-bedroom contemporary style home with Bungalow touches. 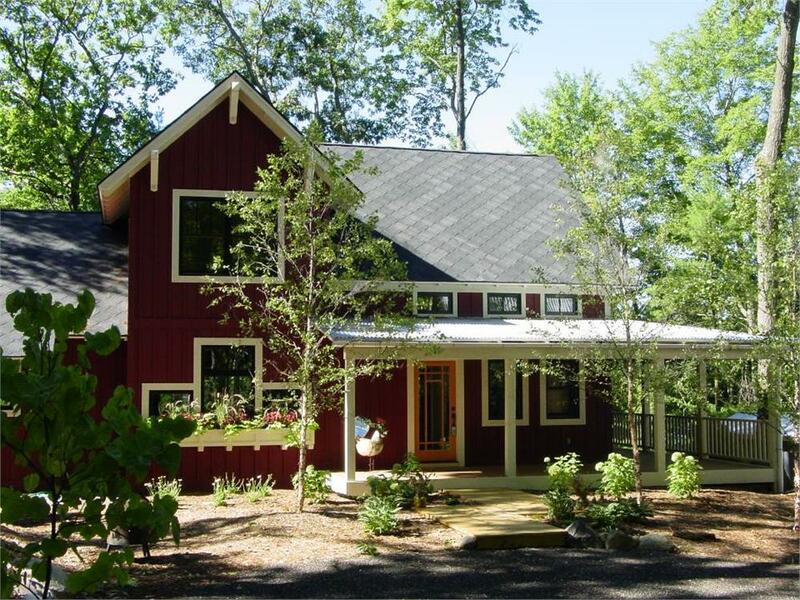 It includes a covered front porch and a Great Room merging kitchen/living/dining areas. For more, view: Plan # 158-1290. Photographs below are from a modern country home with a well-designed and open floor plan, plenty of windows and light, and an attractive outdoor space. For more, view: Plan #168-1044.